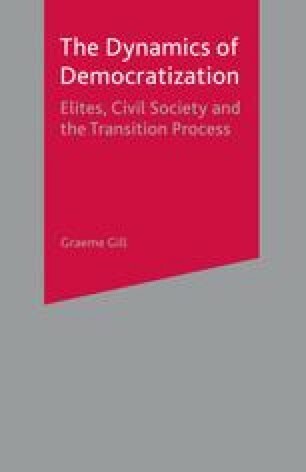 The course of democratic transition, ideally, gives way to the third stage in the process, democratic consolidation. Although there have been differing conceptions of consolidation depending upon what analysts saw to be its specific purpose, to prevent the decay or erosion back to authoritarian rule or to build a qualitatively better democratic system,1 the basic understanding of what consolidation is about has been widely agreed. The notion of consolidation refers to the embedding of democratic procedures into the infrastructure as a whole so that that system is secure and is generally seen as the appropriate way of organizing political life. In the words of two scholars, a consolidated democracy is ‘a regime that meets all the procedural criteria of democracy and also in which all politically significant groups accept established political institutions and adhere to democratic rules of the game.’2 A regime is therefore said to be consolidated when it is seen as ‘the only game in town’,3 when no alternative methods of organizing politics are seen as appropriate replacements of the democratic process. This does not mean that, once consolidated, a democracy will remain stable and firmly in place for ever. Like any regime, a consolidated democracy can break down, but it should be more immune from that process than an unconsolidated democracy would be.